Industry insiders Darius D. Himes and Mary Virginia Swanson demystify the process of producing and publishing a book of photographs. They provide an overview of the publishing industry; a look at the process of making a book; how to market a photo book; case studiesbuilt around discussions and interviews with published photographers; and present resources towards understanding the publishing world. Their forthcoming title Publish Your Photography Book also includes further interviews from industry professionals (artists, publishers, designers, packagers, editors, and other industry experts) who share their own publishing experiences. A must-see for anyone considering publishing their photography book. About mid-way into their video presentation, Swanson and Himes incorporate examples of the various states of my design process for photographer Jessica Hines photography book, My Brother's War. In order to demonstrate the evolution of the book 's design, they present examples - such as the positioning and sizing of the book's title, image choice and positioning of the art for the book cover, chapter headings and various font options - that I sent to Hines for her consideration before we settled on the final "look" for the book. At the time Jessica and I began to work on her project, we had never met and we live in different states. In the beginning, we communicated by phone and then I sent her jpegs and pdf's of the layouts by email. A perfect example that you can design and produce your book from anywhere, as Swanson and Himes mention in their lecture. Mary Virginia Swanson, is a consultant in licensing and marketing of fine-art photography. She also lectures, conducts workshops and educational programs for photographers. Follow her blog, Marketing Photos, a valued resource for photographers. Darius D. Himes, cofounder of Radius Books, is also a lecturer, consultant, and writer. Organized by Arezoo Moseni, Artist Career Development Series. 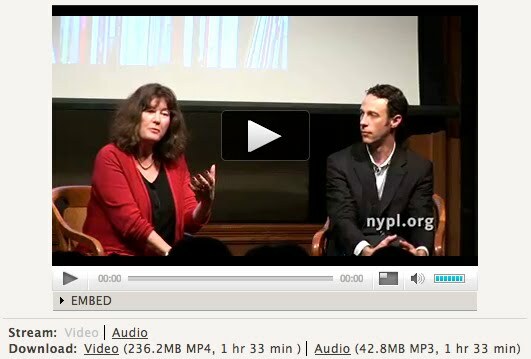 And thank you New York Public Library. This was really interesting, and I thank you for posting it. Oh great! Thank you for posting this Elizabeth, it's been an inspiration that something like this is possible.